Filed to: Danger!Filed to: Danger! Forget fireworks, celebrate this 4th of July with a towering inferno of science. 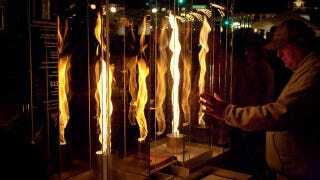 Practical Pyromaniac William Gurstelle explains the physics of the phenomenon and shows us how to build our own. Fire tornadoes, also known as fire whirls, were a key factor in the extreme deadliness and destructiveness of the October 1871 fires. They form only rarely, when a "perfect storm" of wind, low humidity, abundance of fuel, and bad luck come together. But such were the conditions in Chicago and Peshtigo. In Chicago, fire crews had a chance at containing the fire early on, but the moment the fire whirls kicked in-carrying burning planks aloft and depositing them three-eighths of a mile ahead of the firefighters-the city was lost. In Peshtigo, the fire tornados were even larger and more destructive. Forming quickly from great heaps of dry organic material in the dried-up swamps on the west side of the area, the fire whirls swooped into the town. According to the U.S. Forest Service, fire whirls are frequently observed in wild land fires. They are most often small, but large ones may form, depending on atmospheric and fuel conditions. Scientists estimate that the biggest whirls have rotating air speeds that exceed an F-5 tornado, reaching a whopping 300 miles per hour. Meteorologists would term such a phenomenon a vortex, which is a volume of fluid possessing a rotational motion. Examples of natural vortexes abound: smoke rings from a cigarette, water going down a drain, and dust devils. In fact, a fire whirl and a dust devil are similar in many ways. Both form when a layer of hot air is covered with a layer of cooler air. The hot air, lighter and more buoyant, pokes a hole in the cool air above it and rises up through the opening. If the conditions are right, the rising hot air begins to spin, and a whirlwind forms. The rotational trigger for the vortex could be as simple as a gust of wind rushing past a rock or small mound of dirt. The difference between a dust devil and a fire whirl is to some extent merely a matter of degree. Where the surface temperature of the dry, dusty earth that typically creates the dust devil can be as hot as 150°F, the fire whirl is created by air temperatures that may exceed 2,000°F. These extreme temperatures create massive columns of rising hot gas that shoot up erratically through the cool air layer. The hotter the fire and the more unstable the atmospheric conditions, the more erratically the hot gas rises. Some small triggering event makes the fire begin to spin as it ascends, the hot gas slipping by and spinning around with the cool air containing it, due to friction. A fire whirl is born. In the center core of a whirl, the air is drawn down, while on the edge of the vortex there is a strong updraft. The air and hot gas rotate like a hurricane, with the greatest wind speeds closest to the core or eye of the whirl. The movement of the air works like a giant blower or bellows, providing a surfeit of oxygen, which causes the fire to burn with an intensity five to six times greater than a nonrotating fire. Little wonder, then, at the speed with which immense destruction was visited upon the unfortunate town of Peshtigo. The Fire Tornado dramatically illustrates the effect air has on a fire's shape, burning rate, and fuel consumption. 1. This project is for adults or for those under the close supervision of an adult. 2. Keep careful watch on the fire at all times. 3. Remove all combustible and flammable objects from the area. Keep the project away from flammable walls, surfaces, curtains, etc. 4. Do not allow the craft sticks or anything else to ignite. 5. This project creates smoke and should be performed outdoors or in a very well ventilated location. 6. Keep your fire extinguisher close by. 7. Be sure to read the general safety procedures and disclaimers in chapter 1 before attempting this project. 1. In an outdoor space with your fire extinguisher handy, use the modeling clay to create a base for the small fireproof bowl or crucible in the center of the turntable. Place the crucible on the clay and press down, so that the crucible stays put when the turntable is spun. 2. Using epoxy or a hot glue gun, glue the craft sticks to the rim of the turntable as shown in diagram 16.1. Let dry. 3. Taking note of the diameter of the circle created by the craft sticks, roll the aluminum window screen into a 36-inch-high cylinder of the same diameter. Push the straight pins through the fabric of the screen along its length to hold the screen in the proper shape. After the screen is pinned into a cylinder shape, use tin snips or metal shears to cut away the excess screen beyond the pins, leaving an overlap of 1 inch. 4. Cut a small diameter hole or flap in the screen just large enough for the long-handled lighter to fit through and extend into the crucible as shown in diagram 16.2. Now that the fabrication of your Fire Tornado is complete, it's time to try it out. Note: The size and shape of the vortex is best viewed at night. 1. Place 2 teaspoons of kerosene on the cotton rag. 2. Place the rag in the crucible on the turntable. 3. Place the screen cylinder over the craft sticks so that the screen is secured to the turntable when the turntable is spun. 4. Through the ignition hole you cut in the bottom of the screen, ignite the rag with the long-handled lighter. Note the size and shape of the flame in the crucible. 5. Give the turntable a spin by hand or switch the turntable on and set it to the highest available speed. (The faster the rotation, the higher the tornado.) Immediately, the column of flame inside the wire cylinder dramatically grows in height. The fire assumes a spiral shape, similar to a tornado! 1. Stop the rotation of the turntable. Put on your gloves and remove the screen. 2. Invert the large bowl and place it over the flame, firmly on the turntable surface. This deprives the flame of air and extinguishes it. This project clearly shows the effect of air on the size and quality of a flame. A flame is composed of hot gases that emanate upward from the center of the burning materials. As these hot gases travel upward, over the flame, they displace the cooler air above it, which sinks down into the cylinder. Because the cylinder is spinning, centrifugal motion pushes the cooler air toward the rotating screen, making the relative air pressure at the screen higher. But if the pressure is higher at the screen, then it's got to be lower somewhere else, namely in the hot area above the flame. The low pressure there allows the hot, ignited gases from the burning rag to reach upward more easily, creating the flame vortex of the fire tornado.